'Fat is bad for you' is a major nutritional message which has been taken on board by millions of concerned consumers all over the world in the last few decades. It is, however, a misleading and simplistic message. Some fats do indeed have adverse health effects, and there is no doubt that obesity is a health risk. However some types of fat are beneficial and, indeed, are as essential for health as vitamins and amino acids. This paper will examine some of these 'healthy fats'. Fats (and oils, which are simply fats which are liquid at room temperature) are composed primarily (>98%) of triglycerides, and the triglyceride molecule comprises of a three-carbon backbone to which are attached three long-chain molecules known as fatty acids. It is these fatty acids which determine the physical and biological properties of the fat, and so I will refer primarily to fatty acids from now on rather than fats as such. Fatty acid molecules normally found in food are in the form of a long carbon chain, 16 – 24 atoms long, containing a variable number of double bonds with a carboxylic acid group (COOH) at one end and a methyl group (CH3) at the other. The properties of any particular fatty acid are primarily determined by the length of the carbon chain, the number and position of the double bonds, and their type. Within the large number of possible fatty acids, there are two groups of polyunsaturated fatty acids which can be distinguished, known as the w–6 and the w–3 series; so called because they all have either 6 or 3 carbon atoms respectively between the methyl end of the molecule and the first double bond. These two series of fatty acids are essential nutrients which cannot be manufactured in the body: without them, a range of deficiency symptoms appear and so they are referred to as 'essential fatty acids' (EFAs). The symptoms associated with a deficiency of w–6 EFAs are much more severe, and may lead eventually to death. The w–3 series has been covered by the previous speaker, so it will not be considered in any further detail. Membrane structure - w–6 fatty acids are key components of cell membrane structure and affect both membrane fluidity and the properties of a range membrane-bound receptors, enzymes and channels. Skin permeability - w–6 fatty acids are required to maintain the barrier characteristics of membranes in the body. For instance, the water permeability of the skin is increased (leading to more rapid drying out) if there is a shortfall of w–6 EFAs. Cholesterol movement - Cholesterol is moved around the body in the form of esters with fatty acids and w–6 fatty acids in particular appear to increase the solubility of cholesterol. Precursors for regulatory molecules - w–6 fatty acids form the substrates for the production of a range of short-lived regulatory molecules, including prostaglandins, leukotrienes and hydroxy-acids. These are produced and used locally for a wide range of functions, including control of inflammation, platelet aggregation and vasoconstriction/dilation. The key fatty acid in the w–6 series is linoleic acid (LA), as this is the starting point for the synthesis of all the other w–6 fatty acids. It has a backbone of 18 carbon atoms with two double bonds at the 6 and 9 positions (counting from the methyl end) and is common in a healthy diet, being found particularly in seed oils such as sunflower, soya and maize. In the body, it is converted by an alternating series of desaturations and elongations to g-linolenic acid (GLA), dihomo-g-linolenic acid (DGLA) and arachidonic acid (AA) . This conversion series is mirrored by a similar path in the w–3 series, with a linolenic acid (ALA) as the starting point instead of LA, using the same or similar enzymes. The fatty acids DGLA and AA are particularly important as starting materials for the production of regulatory molecules, as mentioned earlier, with DGLA being the source for anti-inflammatory and anti-thrombotic molecules, and AA being the source for molecules with the opposite effect. Furthermore, the DGLA metabolites are inhibitors of the release of AA from body stores and the production of AA metabolites. It therefore follows that the balance between the levels of the two fatty acids is important for normal body function. DGLA is not found in a normal diet and has to be synthesised by the body from LA by way of GLA. AA, on the other hand, is readily available from the diet (from, for instance, meat and eggs). Therefore, if there is any disturbance in the production of DGLA from LA, it will lead to a reduction in DGLA metabolites. Production of AA will also be reduced, but will be partially relieved by dietary sources, and there will be an increased rate of release from body stores. Thus the balance between the two classes of metabolites will be adversely affected. DGLA is made in the body by the elongation of GLA, by an efficient enzyme (an elongase) which does not appear to suffer any form of inhibition. However, the D6-desaturase (D6D) enzyme which produces GLA from LA works more slowly and can be inhibited by a wide range of factors, including ageing, diabetes, high cholesterol levels, alcohol, viral infections, cancer, zinc or pyridoxine deficiency, and atopic eczema. Thus, in the presence of these factors, there may be a reduction in the production of GLA and hence DGLA, even though there may be plenty of LA available from the diet. In order to deal with this, therefore, there is no benefit to be gained from adding more LA to the diet. What is needed is a dietary source of either GLA or DGLA. DGLA is an extremely uncommon fatty acid, found only in trace amounts in animal products. GLA, on the other hand, whilst not found in significant amounts in common foods, is abundant in the oils produced by some organisms which can be used for foods. Some of these have been developed commercially in order to allow GLA supplementation. The role of GLA in human nutrition has been extensively reviewed elsewhere (Horrobin 1990a, Huang and Mills 1996). The first product to be developed was the oil extracted from the seeds of the evening primrose (Oenothera spp. ), and most of the scientific work on the effects of GLA have been performed using this oil (Horrobin 1990b, Huang and Mills 1996). There is a widespread healthfood market for the oil, and two pharmaceutical products based on the oil (Epogam® for atopic eczema and Efamast® for mastalgia) have been researched, licensed and marketed. Other GLA-containing oils are also sold, including the seed oils of borage (Borago officinalis), blackcurrant(Ribes nigrum) and, more recently, hemp (Cannabis sativa) (Deferne and Pate 1996). There have also been attempts to produce GLA-containing oils from fungi, notably Mucor javanicus (Ratledge 1987), but these have not been as commercially successful as had been anticipated. All of these oils (apart from hemp) contain more GLA than evening primrose, and are cheaper per kg of GLA; it is therefore natural to suppose that they would be better sources. There is however some disagreement as to whether the different oils are equivalent, or even whether some of the oils are harmful, with scientific evidence available to support a range of views (Horrobin 1994, Bard et al. 1997). My personal view is that there probably are differences between the oils in certain circumstances but not in others, and that it would be unwise to presume the equivalence of two oils for any particular purpose without testing them. The high level of w–6 fatty acids in evening primrose oil (around 80% of LA + GLA) would make that my oil of first choice. Blackcurrant and hemp are interesting amongst these oils, in that they also contains significant quantities of w–3 fatty acids, including small amounts of the rare stearidonic acid (SA), which occupies an equivalent position in the w–3 metabolic chain to GLA in the w–6 chain. 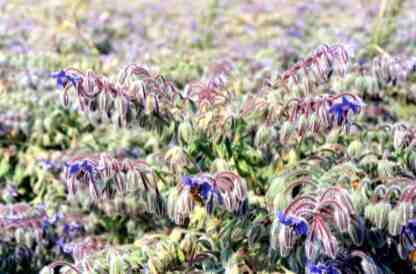 Only a small amount of research has been done on the value of this compound as a supplement, but one company is actively promoting two other seed oils, from Echium plantagineum and Trichodesma zeylandicum, which contain higher levels of SA, as potential ingredients for cosmetic products, and seed of E. plantagineum is now available in tonne quantities (Coupland et al. 1996). There is no reliable collection of data on trade volumes for any of the GLA-containing oils, and the companies involved are secretive about their own performance, so any information should be treated with considerable caution. However, for evening primrose, the global annual consumption of oil is generally held to be in the range 1,000 – 1,500 tonnes; for borage about half that, with the other oils being smaller again. The evening primrose market is dominated by Chinese production (with > 90% market share) because the climate and soils in Northeast China are particularly suitable, and their labour costs are low. This combination has proved to be unbeatable. However, the production decisions are taken by individual farmers, based upon the price which was obtained for the previous harvest, in the absence of any other market information. This is an unstable situation, and Chinese production is characterised by wild swings from over-production to shortage, on a 5–7 year cycle, with prices varying from GBP 3.00 to GBP 15.00 or more per kg over the years. At present, the market is in surplus and prices are very low. This is expected to continue through to the second half of 2001, when prices should start to firm again. Prices thereafter will depend on the size of the 2001 harvest. 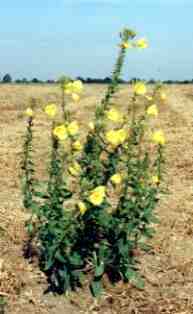 Given this instability, a number of the serious evening primrose users also place some production in other countries, such as Holland, Poland, New Zealand and the US, on the basis that the higher production cost is offset by greater control and predictability. Most of the evening primrose seed grown in China is extracted locally, using either small screw-presses ('cold-pressed') or solvent (hexane) extraction. In both cases the oil is almost invariably refined. In years when prices are high, the press cake may also be solvent extracted to recover the residual oil, which has to be heavily refined to be usable. A new feature of this market is the investment which is being made in new extraction and refining equipment, often in partnership with Western companies, which will hopefully result in an improvement in product quality. Future developments are likely to include the wider use of varieties with higher GLA (12 - 15%), particularly from the 2001 Chinese harvest onwards. Borage, by comparison, is more often traded in the form of seed, and is grown primarily in the UK, Holland, New Zealand and Canada. China is not a significant producer, because hand labour gives no advantage over mechanical cultivation, and the levels of GLA they can obtain tend to be lower. The other countries compete on a more-or-less equally except that Canadian yields tend to be much more influenced by climatic conditions. In a favourable year they are able to undercut the other producers on price, but in a bad year they can leave the market short and prices rise. New Zealand has a special advantage in being 6 months out of phase with the other areas so that, in a shortage, they are able to bring seed to market first and achieve premium prices. The level of instability in the borage market is nowhere near as bad as that in evening primrose, with seed prices varying from around GBP 2.20 to GBP 4.50, and there is a less pronounced cyclical effect. Both borage and evening primrose oils are good raw materials for concentration, to produce oils with much higher GLA contents. Information has been published on processes which can achieve a 70% concentration in one pass, and concentrations up to 93% can also be achieved (Syed Rahmatullah et al. 1994). Whether these become widely used will depend on the additional processing cost and the acceptability to consumers, although, for an encapsulated product, the dramatic savings in encapsulation costs could significantly tilt the balance. Unlike evening primrose and borage, blackcurrant is not grown as a seed crop in its own right - the seed is a by-product from the manufacture of juice and preserves. The main production is in the UK, with some in continental Europe. Production volumes and prices seem to fluctuate substantially from year to year, according to availability, with prices from the 1999 harvest being much higher than previously. Hemp oil production was held back for many years by the difficulty in getting official approval to cultivate a plant with alternative, illegal, recreational uses. With the development of varieties which do not contain psychoactive constituents, these restrictions have eased and there are now a number of commercial sources of good quality oil. The areas grown are larger than for the other GLA crops, but this is because hemp has other uses as a source of fibre, for animal feed, and as an industrial feedstock. A recent USDA report did not forsee a big future for the crop however. Evening primrose oil, borage oil and blackcurrant oil are all primarily sold into the healthfood market in the form of refined oils in soft gelatine capsules, with small amounts of oil being used for cosmetic and veterinary purposes. With hemp oil, the pattern is reversed, with the bulk being used for cosmetics. There is scope for these oils to be used much more widely. Soft gelatine capsules are used as the main delivery medium because the gelatine acts as an effective barrier to atmospheric oxygen and hence prolongs the shelf life. However they are expensive, accounting for 30-50% of the final product cost, and they are not well liked by consumers as they tend to stick in the throat. Alternative delivery systems, such as metalised foil sachets, or metered oil sprays, would seem to provide similar protection for the oil but greater consumer acceptability at reduced cost. There would also seem to be considerable scope for the incorporation of GLA oils into a wider range of product types. Almost any product which already includes (or could include) polyunsaturated oil in its makeup would seem to be a candidate, provided that high temperatures (>100°C), such as from deep fat frying, are avoided during manufacture and use. The reasons for this are that the structure of the LA and GLA molecules can be damaged at high temperatures; and that oxidation proceeds much more rapidly. Anyone interested in using a highly polyunsaturated oil such as the GLA oils in their products, should be aware of the problems associated with oxidation. This is the process by which atmospheric oxygen attacks and breaks down the fatty acid molecules, to produce off-flavours and unpleasant secondary products. In common terms, we refer to an oxidised oil as rancid. Fatty acids are vulnerable to oxidation in proportion to the number of double bonds in their molecules, so LA and GLA (with two and three bonds respectively) are particularly vulnerable. Oxidation proceeds through three stages. In the first stage, the fatty acids are directly attacked by oxygen to produce hydroperoxides. These then decompose over time to produce a range of aldehydes and other secondary oxidation products. Finally, in a severely oxidising environment, these can combine to form polymers. (It is a little known fact that evening primrose oil makes an excellent, though expensive, drying oil for paints (Litvinchuk 1939)). The oxidation of oils is also autocatalytic, which is to say that the reaction produces its own catalyst, so that it runs slowly at first and then builds up speed in an exponential fashion. Oxidation can be controlled through a range of strategies. The oil needs to be carefully segregated from oxygen at all times particularly during the refining stage, either by barriers or by blanketing it with an inert gas such as nitrogen. Certain metal ions act as oxidation catalysts, so care needs to be taken to ensure that all metal surfaces are inert (e.g. stainless steel) or lined with inert material (e.g. polyethylene or epoxy resin). Antioxidants (particularly vitamin E) are routinely added to the oils prior to final packaging. It is worth noting that crude evening primrose oil has a very high level of natural antioxidants (which result from the seeds' ability to remain viable in the soil for many years) but that these antioxidants are largely removed by refining. There is an argument therefore that the most stable evening primrose oil will be achieved by a careful extraction and filtering but with no further refining. If well made, the oil will have a clear golden colour and pleasant, nutty taste. w–6 fatty acids play a key role in human metabolism but, because of various factors common in the Western societies, many people may be suffering from some degree of functional deficiency. There is therefore a case for some form of supplementation with oils containing GLA, which can alleviate this deficiency. Such supplements have been available and successful for many years in the healthfood market and are well understood by consumers. The time may therefore be ripe for their use to be extended into a wider range of 'enhanced' foodstuffs. Methods of analysis of fats and fatty oils. Other methods. Determination of peroxide value. BS 684-2.14:1998 ( ISO 3960:1998) 12 pp. Methods of analysis of fats and fatty oils. Other methods. Determination of anisidine value. BS 684-2.24:1998 (ISO 6885:1998) 12 pp. Bard, J.M., Luc, G., Jude, B., Bordet, J.C., Lacroix, B., Bonte, J.P., Parra, H.J., Duriez, P., 1997. A therapeutic dosage (3g/day) of borage oil supplementation has no effect on platelet aggregation in healthy volunteers. Fundam. Clin. Pharmacol. 11, 143-144. New sources of lipids containing stearidonic acid - powerful moderators of inflammation. Presented at IFSCC 19th Congress, 22-25 October1996. Hemp seed oil: a source of valuable essential fatty acids. Horrobin, D. F. (Ed. ), 1990b. Alan R. Liss, New York, 595 pp. Huang, Y.-S. and Mills, D. E. (Eds. ), 1996. Gamma-linolenic acid metabolism and its roles in nutrition and medicine. AOCS Press, Champagne, Illinois, 319 pp. Rubber, oil and fibre from the evening primrose. Phillips, J.C. and Huang, Y.-S., 1996. Natural sources and biosynthesis of g-linolenic acid: an overview. In: Huang, Y.-S. and Mills, D. E. (Eds. ), 1996. Gamma-linolenic acid metabolism and its roles in nutrition and medicine. AOCS Press, Champagne, Illinois, 1 - 13. Lipid biotechnology: a wonderland for the microbial physiologist. g-linolenic acid concentrates from borage and evening primrose oil fatty acids via lipase-catalysed esterification.